Not much change recently, in with the Grey-lags are still single Canada, Taiga Bean and Greenland White-front. The two European White-fronts are still being seen regularly and 11 Pink-feet wre counted today(23rd). The Ring-necked Duck is still in residence on Ancum loch where it was keeping company with four Pochard on the 18th. Passerines are still scarce; though that is normal for here in the winter, the best counts being 45 Snow Buntings on the 15th, 16 Twite on the 18th, 56 Fieldare on the 21st and 141 Skylark on the 23rd. Small numbers of thrushes are still present on the island with the Mistle Thrush being seen again on the 9th. A Taiga Bean Goose was an addition to the goose flock from the 11th. 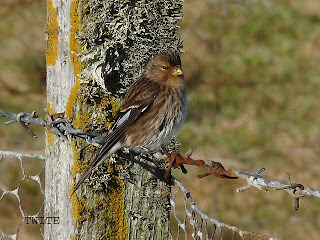 Finch numbers are increasing again has spring draws closer with 20 Linnet on the 12th and 72 Twite counted in the remains of the obs crop fields on the 13th. 45 Snow Buntings at westness on the 12th beats the years previous highest total of 17. The female Ring-necked Duck as been on ancum loch throughout.